Special event invitations like a 25th anniversary party invitations, or beautiful wedding invitations to your very special day. Personal printing includes canvas photo printing, sticky back poster printing, color copies, lamination, and more. 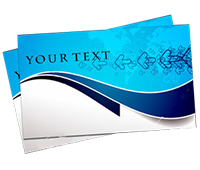 Macon Printing has your small business printing needs covered like full color brochures, rack cards, business cards and other business printing needs. Presenting a professional image to your customer is very important to your small business so it's also very important to Macon Printing. Looking for a great Christmas gift or birthday present idea for your teenager? What about a wall grapci of them playing sports they could stick on a wall over and over from place to place? Using a peel & stick removable fabric material Macon Printing can produce a low tack adhesive graphic from your photos just like our canvas printing.